Activist Bree Newsome is the 2017 Freshman Convocation Keynote speaker. Photo by David J. Hawkins. 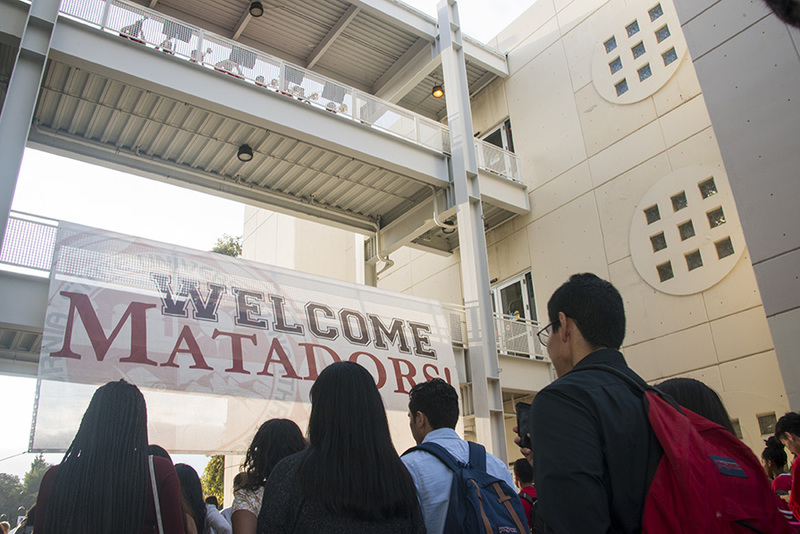 Welcoming new Matadors to Freshman Convocation. Photo by David J. Hawkins. 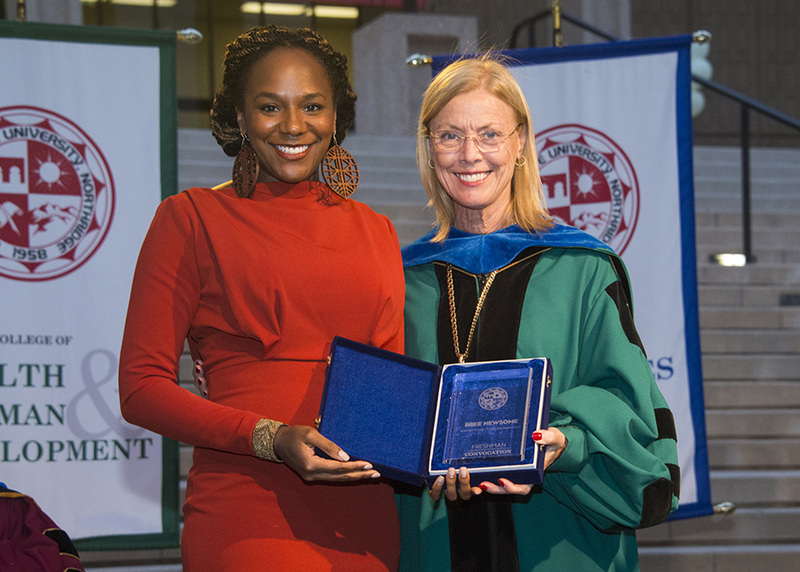 Activist Bree Newsome with CSUN President Dianne F. Harrison. Photo by David J. Hawkins. Braulio Diaz ’17 (Engineering) was chosen as the student speaker for the convocation. He was one of this year’s Outstanding Graduating Seniors. Diaz encouraged students to participate on campus and to take chances on bettering their time at the university. Photo by David J. Hawkins. Freshmen walking to the Oviatt Library at Freshman Convocation 2017. Photo by David J. Hawkins. CSUN President Dianne F. Harrison welcoming everyone to Freshman Convocation 2017. Photo by David J. Hawkins. New students walking to their seats at Freshman Convocation 2017. Photo by David J. Hawkins. 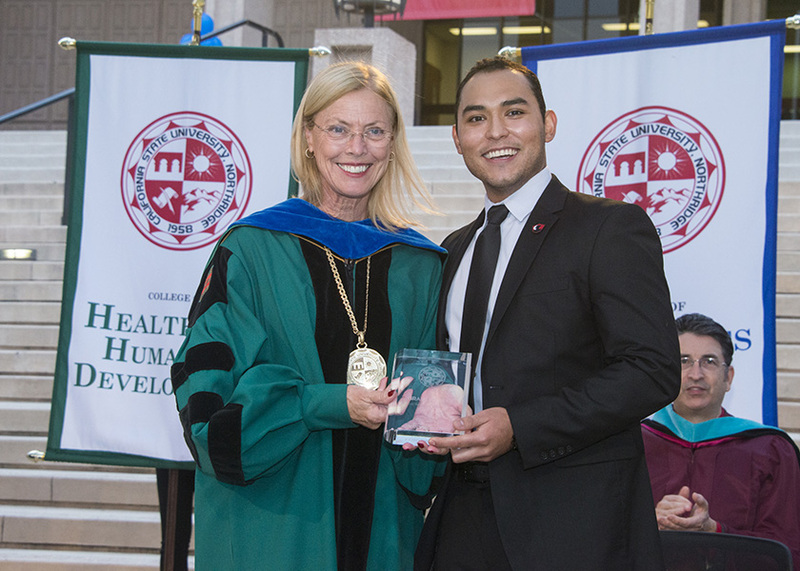 President Harrison presented the 2017 Dianne F. Harrison Leadership Award to Jea Bondoc, a business major from last year’s freshman class. Bondoc achieved a 3.98 grade point average and participated in several on-campus clubs and activities. Photo by David J. Hawkins. Thousands of California State University, Northridge freshmen packed the lawn in front of the Delmar T. Oviatt Library on Sept. 14 for Freshman Convocation, an annual event that formally welcomes first-year students to CSUN. 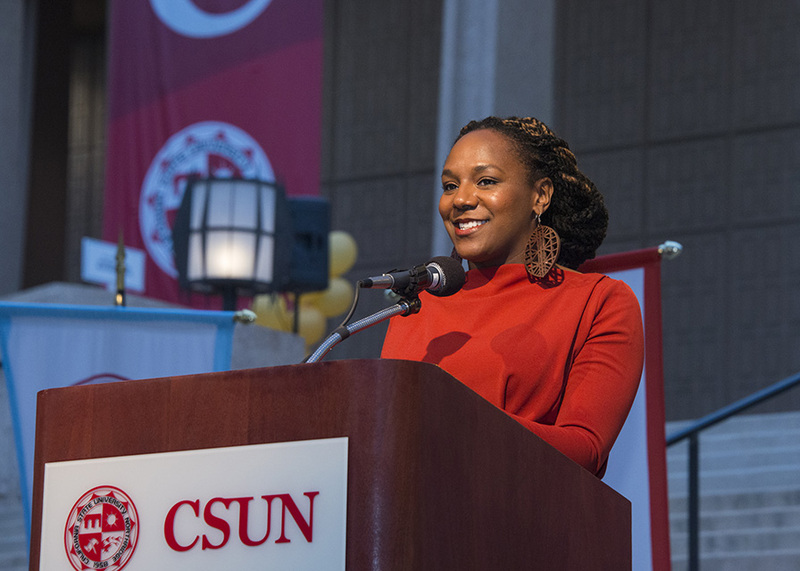 The event included a welcome from CSUN President Dianne F. Harrison and a keynote address by activist Bree Newsome. The themes of the night included perseverance and empowerment for the Class of 2021. 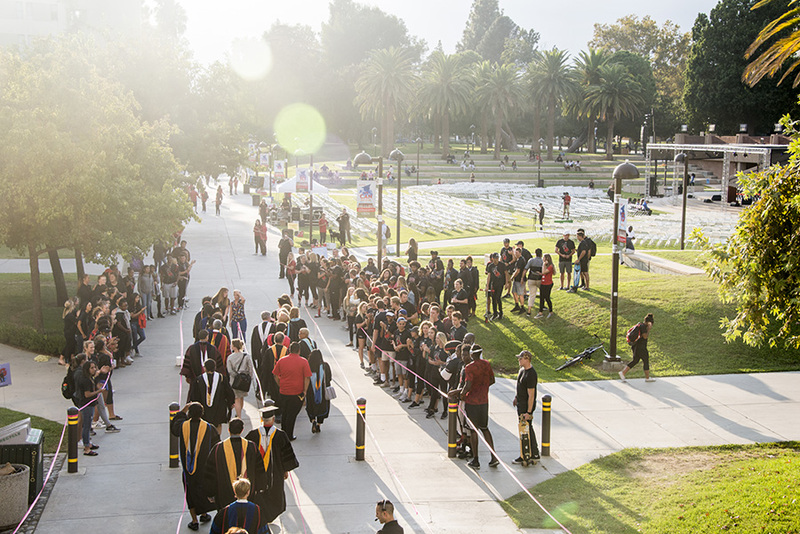 An estimated 2,500 students participated in this year’s convocation. 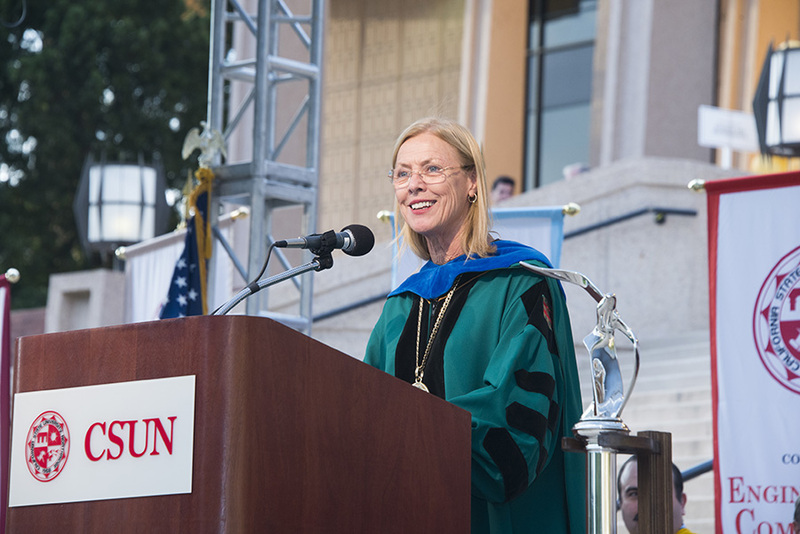 In her remarks, President Harrison told the new freshmen that they make up the future of the country. Newsome was chosen as keynote speaker to complement the freshman class’ common reading selection, Between the World and Me, a book that focuses on race in America from the perspective of author Ta-Nehisi Coates. The keynote speaker gained national attention when she climbed up the flagpole on the South Carolina State House grounds in 2015 and removed the Confederate flag that flew there. 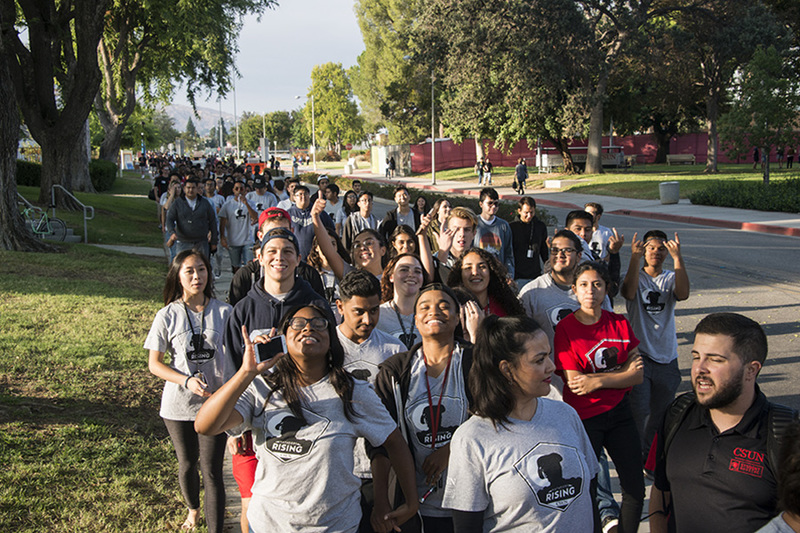 Newsome encouraged the CSUN freshmen to be unafraid, to stand up for their beliefs and to walk their own paths. During her visit at CSUN, Newsome also held a lecture earlier in the day at the Plaza Del Sol at the University Student Union, discussing her experiences and civil rights activism. Braulio Diaz ’17 (Engineering) was chosen as the student speaker for the convocation. He was one of this year’s Outstanding Graduating Seniors. Diaz encouraged students to participate on campus and to take chances on bettering their time at the university. Diaz, an undocumented student, also spoke out against social injustice. He told the CSUN students that they must move forward and be courageous. In response, the audience gave him a roaring ovation. 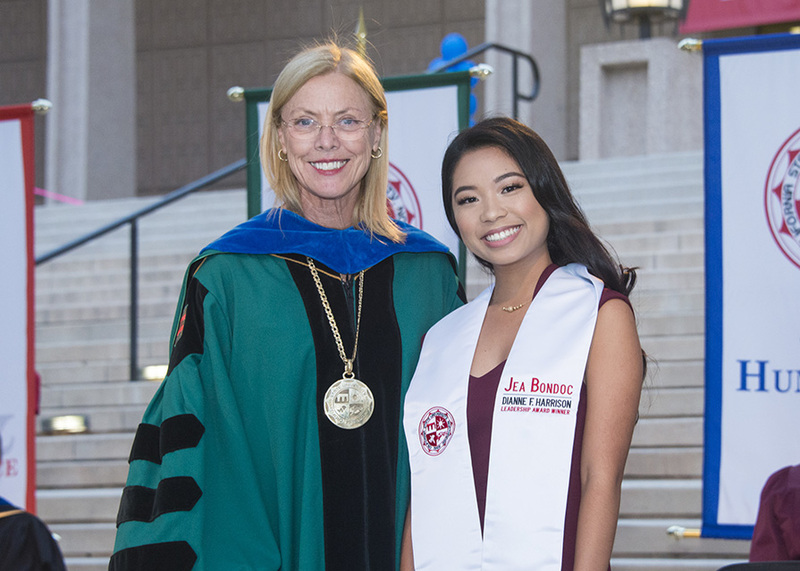 President Harrison also presented the 2017 Dianne F. Harrison Leadership Award to Jea Bondoc, a business major from last year’s freshman class. Bondoc achieved a 3.98 grade point average and participated in several on-campus clubs and activities, such as the Accounting Association, Filipino Student Organization and New Student Orientation leadership. Harrison told the new Matadors that they are the future and will be the change the world needs.